During the bison monitoring conducted by the bison rangers in the Southern Carpathians last week, four of the 30 bison in Armeniș were found dead. The weakest bison in the herd were outcast by the rest of the group and as a result they became more vulnerable to predators. At least two of them were attacked by a pack of stray dogs that formed in the area. The winter season is a challenging time for the herd of bison that were released in this area in 2014 and 2015, as they are still adapting to the natural environment here. In this period, their search for food puts a serious strain to their condition. The weakest animals might get left out of the herd through a process of natural selection, thereby reducing the risk to the herd by attracting predators. Sadly, this is exactly what happened. 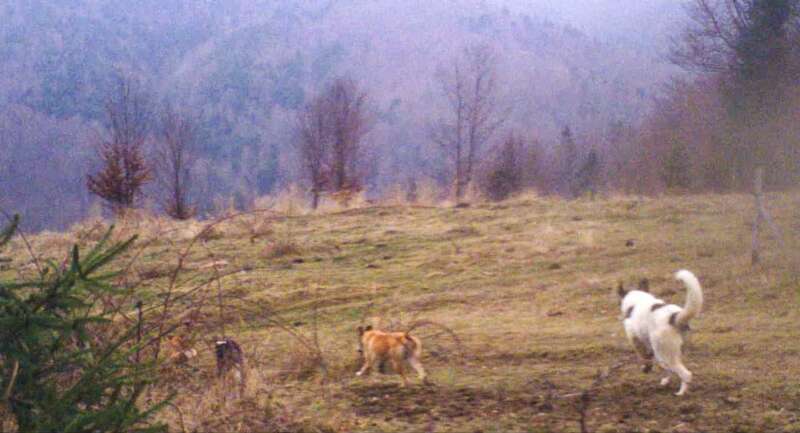 Rewilding Europe and WWF Romania’s local experts investigated the area where the attacks occurred, together with a veterinarian and members of the local hunting association. They analysed the data, the tracks around the bodies, as well as the photos and videos from the camera traps mounted in the area, and concluded that a pack of stray dogs attacked at least two of the bison, both males. A pack of 15 feral dogs has formed in the area and has adapted to live in the wild, without any human care or control. They are not natural predators, but are living off of the wildlife in the area. The long term impact on the trophic chain and consequences are yet to be fully understood. Eight individuals of this pack have been recorded on camera traps that Rewilding Europe and WWF placed in the area, and members of the local hunting association observed all 15 dogs feeding off the body of one of the bison. This pack is now the strongest group of predators in the area, predating on wildlife species like red and roe deer, wild boar and rabbit, in an unfair competition to the local wolf population which faces a reduced natural prey base and as a result lower survival rates. The camera trap photos and footage confirm the presence of a small number of wolves in the area. Locals, especially sheep owners, confirm the disappearance of a number of domestic animals during last year. 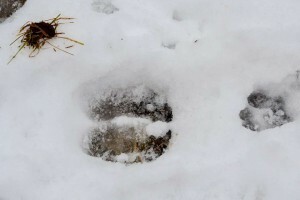 Tracks observed by members of the local hunting association show that a wild boar was also chased and hunted down by dogs. A recent study conducted by the Association for the Conservation of Biological Diversity in Romania shows that stray dogs as well as shepherd dogs left unattended have a negative impact on wildlife. The impact ranges from the transmission of various diseases, to attacks on a variety of wildlife. Hunting ground managers frequently complain about attacks on fauna by unattended or stray dogs, which form groups or packs and kill wild animals. Moreover, their breeding rate is significantly higher than that of the wolf since all of the females reproduce, not just the alpha female as is the case in wolf packs. The female dogs are also available for mating all year round, while the wolf sticks to one specific mating period. It takes two generations for these dogs to acclimatise to the life in the wild. The high density of stray dogs is directly or indirectly nurtured by humans as their settlements are a source of food and shelter. As a result, stray dogs and unattended sheep dogs are powerful competitors to natural predators, and might hybridise with wolves, which is a threat to wild wolf populations as well. Mihai Pop, expert at the Association for the Conservation of Biological Diversity estimates there roughly 40 feral dogs on each hunting ground in Romania, with an even higher density in places neighbouring human settlements, bringing the total number of these stray dogs to tens of thousands. 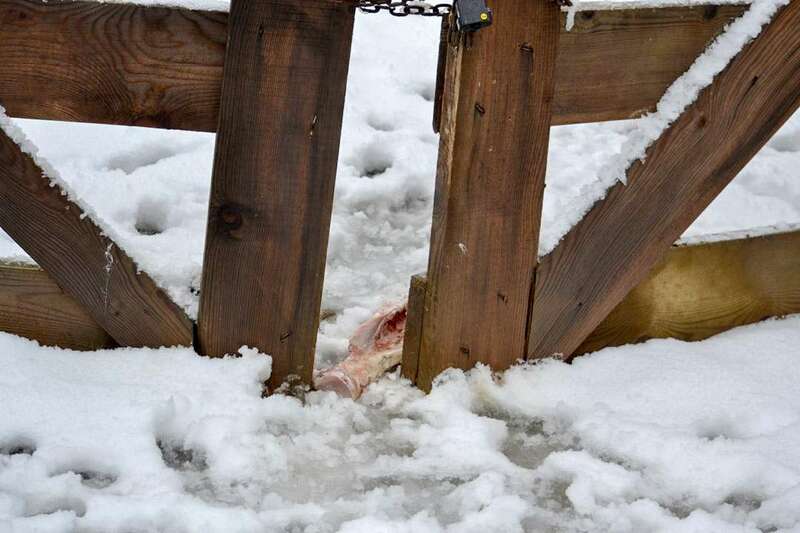 Anca Tomescu, Competence Center Stray Animal Care Director, at Vier Pfoten Romania believes that “the solutions offered by the current legislation in Romania to address the stray dogs issue is inefficient and encourages abandonment. Vier Pfoten is open to collaboration with local authorities and NGOs to implement sustainable and non-violent methods in order to reduce the number of feral dogs”. First of all, WWF Romania is addressing the urgent situation in Armeniș with the local stakeholders, to avoid that more bison might be killed in this area. An adequate evaluation and monitoring of the population, density and group structures of stray dogs at national level is needed to be able to organise an efficient intervention in order to diminish the dog numbers roaming natural habitats. The simple fact that these dogs have managed to hunt down Europe’s largest mammal, including the first bison calf conceived and born in the wild in the Southern Carpathians, is evidence of the scale of the danger they pose to wildlife. 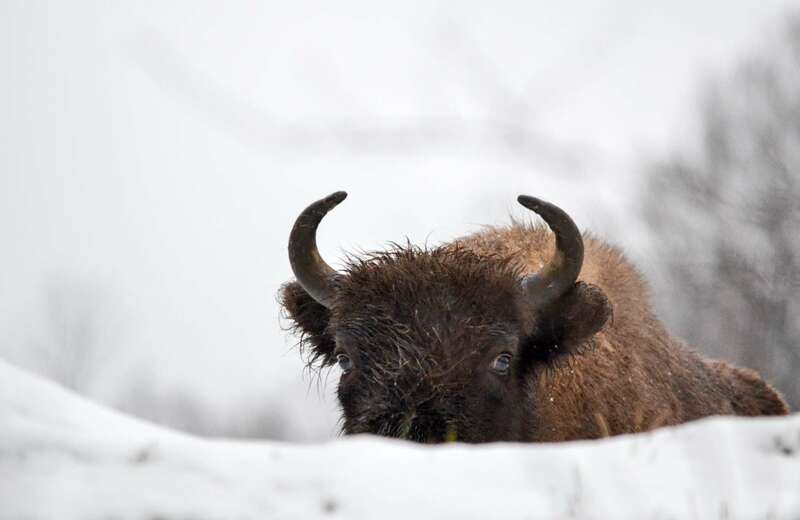 Vanatori Neamt Natural Park, the first bison rewilding site in Romania where 20 bison are roaming free has a wolf pack, yet has not attacked the bison there. The incidents in Armeniș are a wake-up call for an issue ignored by competent authorities for too long. Finally back on stage after more than 250 years!